The East side of the neighborhood sure has an abundance of lovely smokey grey kitties, living close-by one another. 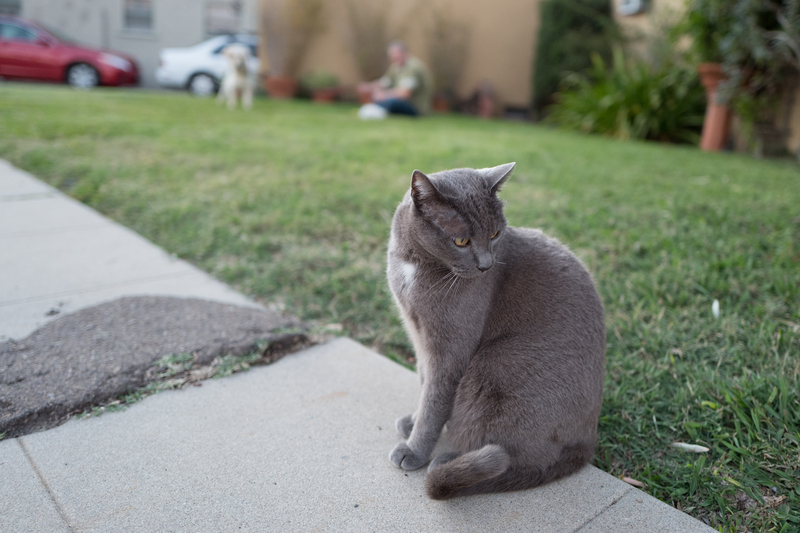 Yesterday, I met Carl, his owner, and dog in a yard near where Mission and Mississippi meet. Down Mississippi, beyond Monroe, Ohana lives within sharp-eyeshot. At the end of the street turn onto Meade towards Alabama and somewhere you may meet Amanda. Along Alabama, there reside Laramie and Smokey, at houses diagonally across the street. I am no cat breed connoisseur and must ask: Are any of these Russian Blue? Carl’s official nickname is Monkey because of his curled tail. Hehe, a block-and-a-half down and over on Alabama roams a tiger-tabby whose real name is Monkey; the old-timer and street’s dominant male turns 14 in March. Along Monroe, just down from Mississippi, lives Bruce, who goes on long walks with his owner and dog. Ha! 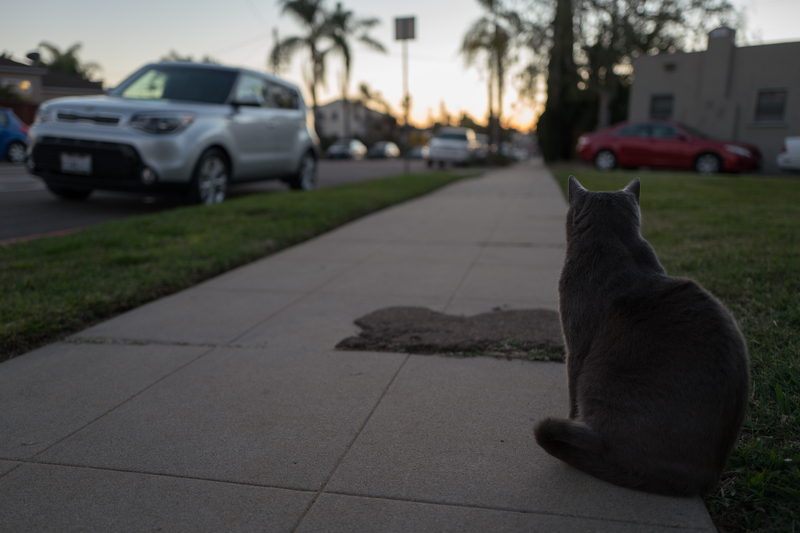 Carl tags along, too, but only for short distances, because his master doesn’t like the cat crossing the street. I shot the Featured Image and companions using Leica Q. I manually set aperture and shutter speed to capture more light, accommodate for motion, and get beautiful bokeh. The main pic blurs Carl’s owner and dog companion; they add to the ambience without taking away from the photo’s subject. Vitals: f/2, ISO 1000, 1/250 sec, 28mm. 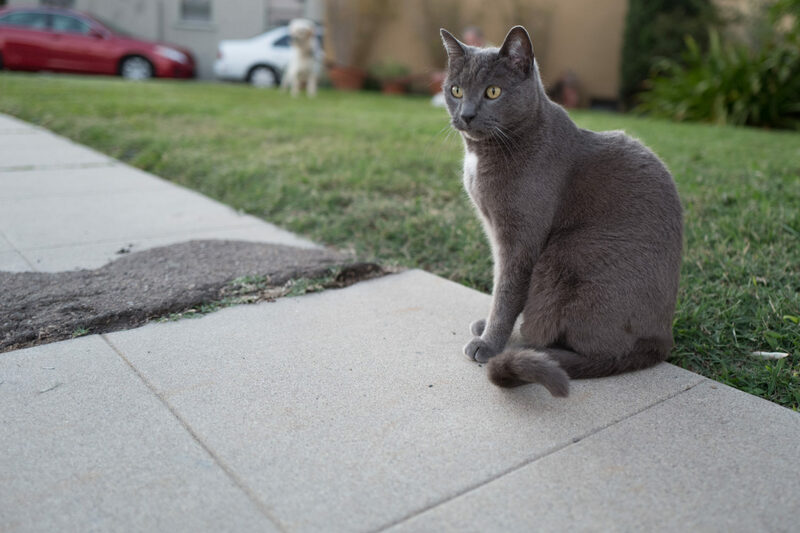 The second photo is a near photo-bomb, but Carl’s owner is blurred just enough behind him. Vitals are same as the first except for ISO, which is 800. BTW, the handsome shorthair comes and goes as he pleases, in or out a doggy door. The third portrait is in some ways my favorite, because of the emotions evoked or possible questions pondered. What is the kitty looking at? Is he a lonely boy? The mood also differs from the others because of the lighting as dusk settles; auto-ISO set 250. Time stamp for all three is 5:19 p.m. PST, or one minute after sunset. I thought about boosting exposure, but only changed highlights to draw out palms and road sign along the horizon. The final photo is the Adobe Lightroom Classic CC auto-corrected edit. I still prefer the darker rendition. And you? BTW, the portrait is composed as shot. Previously featured felines: Scruffy, Roly Poly, Woo, Skull, Biscuit, The Colonel, White, Chipper, Frisky, Stretch, Needy, Farfisa, Mates, Hunter, Pee-Pee, Blue, Blue Too, Bonded Pair, Patience, Fess, Jumper, Frenemy, Looker, Cozy, Scout, Lurks, Skit, Mini, Betty, Black and White, Stalker, Bell, Chill, Sammy, Scratch, Poser, Star, Grey and White, Watcher, Herman, Comet, Roman, Willow, Chub, Nimbus, Watson, Lilo, Kit, Pepe, Twilight, Sebastian, Spot, Booger, Ash, Veruca, Riley, Mellow, Bonde, Flower, Glass, Black, BeBe, Fang, Bruce, Siamese, Pounce, Tortie, Haiku, Fraidy, Peso, Daniel Tiger, Dusk, Stride, Dainty, Spry,Tabby, Betty Too, Still, Levi, Shadow, Sophie, Wink, Ferals, Momma, Charlie, Tux, Cool, Benny, Jellicle, Itchy Valentino, Goldie, Nine, Amanda, Siesta, ChaCho, Charlie, Too, Mika, Crystal, Seeker, Mittens, Dancer, Smokey, Monkey, Captain Blackbeard, Season, Maven, Tink, Chunk, Curious, Hanoi, Bella, Tarry, Guido, Maxine, Mr. Kitty, Peohe, Panda, Frankie, Sunshine, Twain, Willow, Too, Brawn, Reddy, Burglar, Laramie, Lupe, Bright, Tom, Charm, Buddies, Boss, Ohana, Seer, Fresh, Token, and Lola.